Esad Ribic and Ive Svorcina’s artwork is stellar once again. What worked best for me was the eschewing the details of literally every living creature on Battleworld locked in battle and focusing on individuals. The pacing of personal interactions between the major players and the clashing of god-like powers was perfect. For anyone who didn’t follow Hickman, Ribic, and Svorcina’s Secret Wars over its protracted serial publication (really one of the few marks against it), a collected edition is scheduled for release on March 16th, 2016. 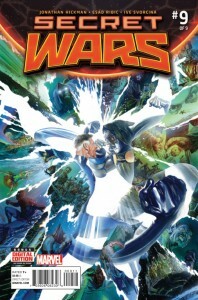 Readers can also find the series digital through the Marvel.com and Marvel Comics mobile apps. – Jonathan Hickman, Esad Ribic, and Ive Svorcina’s Secret Wars is published by Marvel Comics. DARTH VADER #15 – Very ready for the Vader Down cross-over to end. It started out strong, but as soon as the supporting characters from the Vader series (homocidal C3PO, R2WMD2, and the evil Wookie) moved into the spotlight I completely lost interest. ALL NEW WOLVERINE #4 – I’m still mystified by the fact that this is the best ANAD Marvel series I’ve picked up. Solid story, good cast, and top notch art. Totally unexpected. EXTRAORDINARY X-MEN #5 – I wish I had rave reviews for this, or any of the X-titles, as I do for All New Wolverine. The “No More Mutants” rehash with the Terrigen Mists is a concept that does nothing for me, and the books aren’t offering much else. SECRET WARS #9 – See comments above. AGENTS OF SHIELD #1 – On the fence with this one. Just feels like too many attempts to make these characters part of the Marvel Universe while the Marvel Universe just keeps changing.